Billiards is often referred to as a cue sport. It has been a popular sport since the 15th century where it first emerged in France. 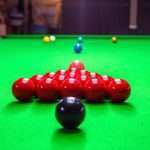 Billiards is divided into three subdivisions: Carmon billiards, pocket billiards (aka pool) and Snooker. It evolved from an outdoor sports games that involved sticks and balls on a lawn. You can find this game in many college dorms, bars, recreation centers and military day rooms in America. And although it’s been popular in this country for more than 50 years, the details and strategies of the game are a mystery to most of us. What game is this? Foosball! 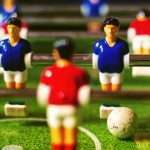 Also called table soccer, while the goal is somewhat simple, foosball rules and strategies can be complex. A typical foosball table has eight rods and nine balls are used per game. There are usually either two players or two-person teams. The first person or team to get the ball into the opposing team’s goal with five of the balls wins the game.